(CNET) -- Twitter users on Thursday will, for the first time, be able to make voice calls directly to each other through the microblogging service. 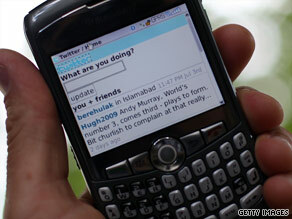 During the beta period, voice chats will be limited to two minutes on Twitter, the company Jajah said. A new third-party offering from Jajah known as Jajah@call is expected to go into beta Thursday morning that will allow Twitter users to initiate a two-way voice chat with other users by typing "@call @username" -- where "username" is someone's Twitter ID -- into any Twitter client. During the beta period, the company said, the calls will be limited to two minutes, but the company will evaluate that length during beta. However, it sees the two minute period, after which the call will end, as "the verbal equivalent of a tweet." According to Jajah, an Internet communications provider with tens of millions of users, the service will allow a user to place a call to any other user, so long as the second person follows the first on Twitter and both have Jajah accounts. The service is free to use and is expected to work on any Twitter-enabled device, from PCs to smart phones. One important element of the service is that users can keep their phone numbers private, yet be able to have voice chats with just about anyone on Twitter. To be sure, since the calls are initiated by one person, the recipient may well not be online, or may choose to ignore the call if they don't want to talk. There are currently several applications that allow users to create voice-to-text Twitter posts, known as tweets, but it does not appear that anyone has yet made it possible to initiate voice communications directly between Twitter users. Coming on the heels of the announcement earlier this week that Facebook users will now be able to communicate with each other via voice -- using a third-party application from Vivox -- it's clear that there is a strong interest, among service providers, at least, in taking leading social networks beyond strictly text communications. Whether large numbers of users choose to get on board is unknown at this point, of course. And given that neither the Facebook nor the Twitter voice services are being provided by the social networks themselves means that some users will choose not to get involved for fear of privacy, stability or other concerns. Still, if these third-party services end up being successful, it would be natural to expect that Facebook and Twitter may decide they need to step up and directly embed such technologies into their offerings. And there is a precedent for such a move. After Vivox began offering Second Life users a third-party voice solution, the virtual world's publisher, Linden Lab, decided it needed to take advantage of the technology. Today, thanks to a formal partnership, Vivox's voice service is formally integrated into Second Life. And while it may be some time before such a thing happens with either Facebook or Twitter, or any other major social network, one would have to think that it's only a matter of time.